A study released from Northeastern University looked at the use of Vancomycin for Lyme. The drug which can only be administered intravenously and is more toxic than most commonly used alternatives. IM therapy may be used but is perhaps very painful. Oral vancomycin does not leave the GI tract and is only for C. diff. Studies are not in agreement. Zhang found the drug to be relatively ineffective in vitro, as have others. The new study found that both Rocephin and vancomycin are effective against stationary phase cells – round forms and biofilms. Vancomycin was combined with a quinolone to sterilize a culture. In an immune deficient mouse doxycycline did not clear disseminated but both ceftriaxone (Rocephin) and Vancomycin were effective. Vancomycin may be slightly better than Rocephin but this far from clear. Both inhibit peptidoglycan synthesis, the basis for cell walls. In 2017, the Biophysical Journal published a study about the impact of Vancomycin on Lyme spirochete motility, significantly impaired. The Peptidoglycan – cell wall material (under an outer membrane) was weakened with low concentrations, subtherapeutic, of vancomycin which also inhibited the formation of round forms or blebs. Wounded spirochetes, unable to swim very far may do little harm. The drug may prove very useful, especially with subtherapeutic dosing, within a cocktail approach. Vancomycin has been used for decades in the treatment of MRSA, a feared superbug. The drug is very nephrotoxic and can cause irreversible kidney failure: serum concentrations and renal functions must be watched carefully. Although vancomycin is not hoarded over by ID docs like daptomycin, ID doctors will be concerned about sudden wild use of the drug. Going back further, 1996 – A G Barbour, an IDSA stalwart, found the following. Vancomycin eliminated Lyme in immunodeficient mice only when given within 3 days of infection. When given at 7 days post infection the germs persisted; viable spirochetes were found in the mouse brains. In 1993 Barbour demonstrated that in vitro vancomycin was an effective anti-Lyme therapy. It has been long known that vancomycin has anti-Lyme activity. We need to know a lot more. Treating Lyme falls within the large purview of “the art of medicine.” In “the system” so called evidence-based guidelines dictate medical practice. The guidelines dictate what the disease looks like and how it is to be treated. The existence of chronic Lyme as we know it is soundly rejected. Nothing has changed. Doctors who believe in chronic Lyme agree on a several things: Lyme is a tragic, underappreciated epidemic; Lyme is very difficult to treat; Lyme has many faces, the “great imitator;” coinfections are an unappreciated huge factor and I am sure a few other things. Doctors collectively known as LLMDs are a heterogenous group. They don’t agree on how best to treat the illness(es). Doctors who treat the disease(s) realize we still know very little as we try to improve our approaches as times moves on. It is important not to jump on every new therapy as “the answer” and be mindful of toxicity and First do no harm. I ask readers to refrain from jumping from preliminary preclinical small, limited basic science trial data and making quantum leaps to a new people therapy. Vancomycin, unfortunately, is not the cure. A 56 year old male has suffered with Lyme off and on for the better part of 10 years. Symptoms come and go but have fairly easy to control. He suffers with a mood disorder. Bipolar 2. He has a history of mild manic episodes alternating with depression and the disorder is chemically controlled. He has complained of recurrent low grade fevers and night sweats recently. He came in to my office stating his Babesia was relapsing. He was right. The patient's blood smear confirmed the self diagnosis. Some Lyme-literate people are quick to blame tickborne illness for everything - including all mental illness. It is easy to go overboard. Bipolar illness exists apart from tickborne disease in this case. Babesia and other central nervous system infections may exacerbate preexisting mood disorders. Lyme and associated infections have been associated with every neuropsychiatric syndrome reported. Clues that infection is not the primary cause include: strong family history and mood disorder predates Lyme infection. Babesia is frequently associated with depression, especially increased tearfulness. Babesiosis, the clinical syndrome associated with Babesia infection is frequently persistent, resistant to therapy and prone to relapse or recurrence. (Relapse same infection, recurrence new infection). A new study was released last week ( UCLA) which amazingly discussed a new paradigm. In the case of E. coli: perhaps it best to hit highly resistant superbugs with 3-4 antibiotics, which all work by different mechanisms rather than a single drug which works only by one. Some agents include: Mepron, Malarone, artemisinin, artemisia (bioavailability), Coartem - more bioavailable, cryptolepis, "Buhner herbs" including sida acuta, Daraprim, Zithromax, Clindamycin, Quinine and low dose heparin. For example, when Mepron doesn't do the job adequately it is not discontinued, rather something else is added. Patients may be on 3-4 agents simultaneously to get the job done. 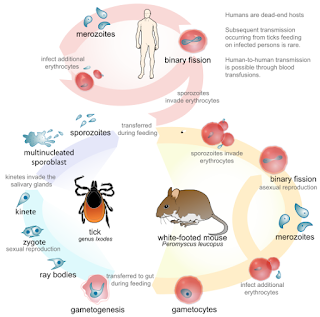 We think human Babesia develop rapid resistance to various agents. We don't know.There is no human data. Animal data supports the thesis. The disease is underappreciated. I suspect if suffers with guilt by association (Lyme). 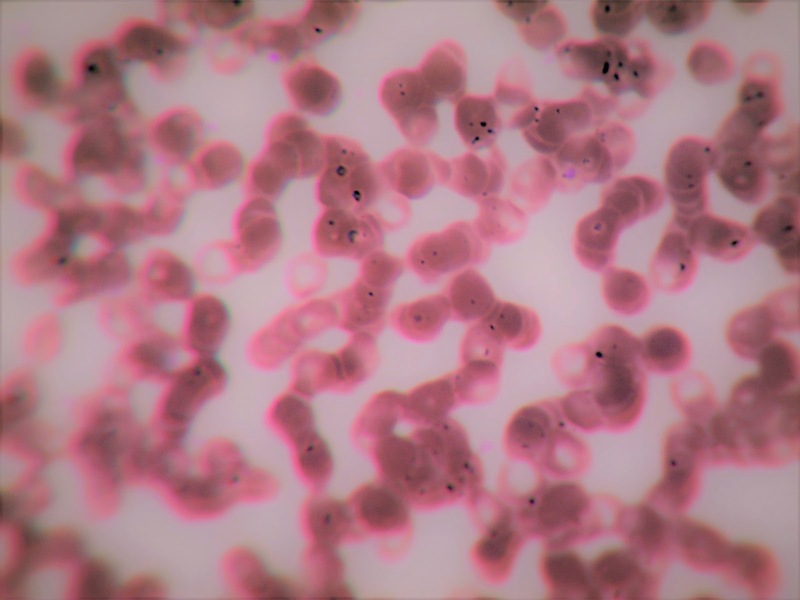 As with Lyme, most experts believe in acute Babesia, not chronic babesiosis. The Babesia lifecycle is presented below. In mice the lifecycle is more interesting -- sexual reproduction. This allows for the transfer of genes from one organism to another. This is an evolutionary advantage RE the development of resistance. In the human host the cells reproduce via an asexual process. The slides can look quite different at times. Most commonly small, dark staining round bodies are seen with Giemsa staining. Resistance develops because random mutations -- mistakes made copying DNA -- occur with great regularity. Sporozoites are released from an infected red blood cell. The small forms attach to the cells and gain entry morphing into the larger merozoites. The merozoites divide in cells, rarely 2 at a time (Maltese Cross). The red cells rupture and the cycle repeats. Additional information: sporozoites morph into an intermediary ring form, trophozoite before becoming a merozoite. Ring form are readily observed. Mature merozoites can rupture creating vermicules, small infective particles. These are harder to pick out. Intermediary morphological forms can present in many ways. Are you a tick magnet? Do mosquitoes make a beeline for you and ignore your companion? You are not crazy. Ticks do like you. A recent European study showed a species of Ixodes ticks preferentially seek out certain blood types. From the ABO Rh subgroups ticks prefer type O blood and type B blood is relatively protective. Ticks find type A blood only slightly less appealing. Ticks, mosquitoes and other blood sucking insects are primarily attracted by CO2 but there are other important factors. The insects can detect hundreds of volatile organic compounds which emit signature scents from our skin. Sweat plays a role. Skin flora play a role. Other genetic factors may be in play. I am lucky and have type B blood – 9% of the US population. You are probably not so lucky. It is true: some of us smell sweeter to ticks and mosquitoes than others of us. Certain chemicals make us less attractive. DEET and Picardin are well known insect repellents and are moderately effective. Other natural substances may be effective, such as: lemongrass, citronella, cedar, peppermint, lavender and geranium. I have no specific recommendation here. There is a lot of discussion on the internet. A patient recently told me he combines several of these substances and has good results. The most important preventative is permethrin. Permethrin is applied to clothes and allowed to dry overnight. Clothes pretreated with permethrin are commercially available. Permethrin persists in/on fabric for a month or more – even if clothes are washed.